Wenco Wooster, Inc. and Affiliates (“Wenco” or the “Company”), after completing its recent acquisitions, now consists of 62 Wendy’s restaurants throughout the Ohio and Indiana region. Wenco is recognized by the franchisor, The Wendy’s Company, as an “A-rated” operator. As a result, Wenco was provided with this opportunity to add to its portfolio of Wendy’s restaurants. 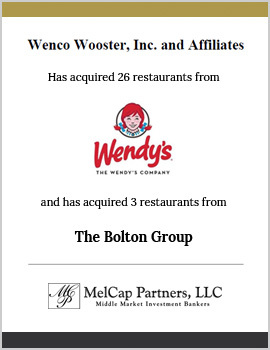 MelCap Partners assisted Wenco in acquiring 26 restaurants from The Wendy’s Company and 3 restaurants from The Bolton Group. As the Company’s investment-banker and financial advisor through this process, MelCap Partners assisted Wenco in analyzing the merits of the acquisitions, conducted store level financial analysis, and developed various financing structure alternatives. In an effort to continue to support Wenco’s aggressive growth plans, the Company successfully completed the acquisition of these 29 additional restaurants. Once integrated, the Company will be poised for future restaurant additions as made available in the market.